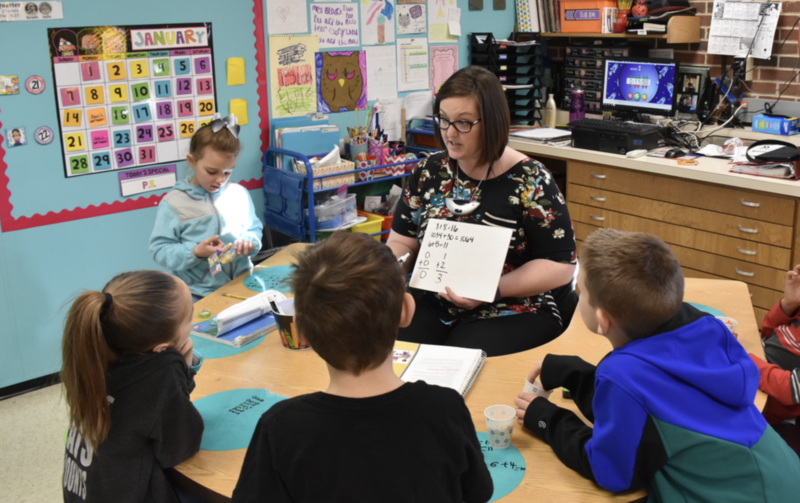 When Mustang Elementary’s Teacher of the Year, Melissa Block, graduated from high school she was headed for the medical field. She played “school” as a child, but her mother was a nurse and it was familiar. Block reasoned it would be a good career with good money where she would be respected. Block took a break from school and entered the work force. She tried the insurance industry and working in medical records, but a sense of fulfillment was missing. When she made the decision to return to school, Block’s daughter had started kindergarten and was a struggling reader. There seemed to be a personality disconnect between the teacher and Block’s daughter. Requests for extra learning activities they could do at home went unanswered so Block set up her own system to help her child learn to read. Block’s first teaching assignment was a kindergarten classroom in Shawnee, followed by kindergarten in Mustang. Block remembers one boy and his parents who hated school. “When he showed up the first day, I knew I had to make this kid change his mind about this, to help the family change their minds about school,” she said. Block makes it a point to send pictures via an app of what students are doing in class. His mother hadn’t signed up, so Block would text her pictures. Block made it a point to text the mother something positive at least once a week. Years later, they still keep in touch. “He was a rascal, but he wasn’t what I expected,” she said. Block said his behavior wasn’t perfect, but instead of possible punishments during recess, she makes students who act out help her in the classroom. They talk about the behavior and set goals. The boy was able to choose his rewards and punishments. She loved kindergarten, but she knew an older grade would be a better fit. Block said she doesn’t have a traditional classroom. She discovered whole brain teaching. She began implementing it last year, and believes it was a game changer. She’s been to two trainings and it has given her classroom new life. It’s a way to integrate classroom management with techniques that use multiple ways to learn. Block said even the hardest concepts, like subject and predicate, they’re learning. Her students who struggle the most are making greater strides with the new teaching style. Block said in some ways teaching is harder than she expected. There are students in her second-grade classroom who are reading the Harry Potter series and other who are still learning to read the simplest books. Block is one of 14 site Teachers of the Year for Mustang Schools. The District Teacher of the Year will be announced in March.